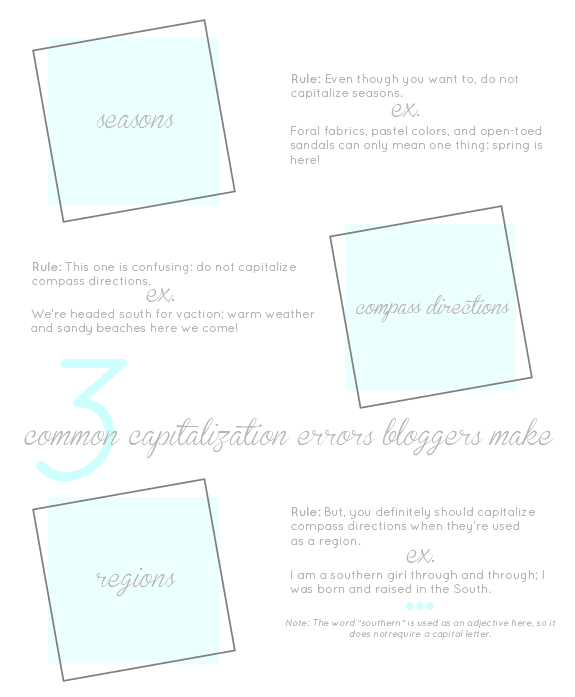 Today I'm continuing with my Better Blogging series with a few capitalization reminders. Capitalization rules are difficult to remember and sometimes seem counter-intuitive. However, if you can remember these three easy rules (or pin it to your Pinterest board), you'll never skip a beat! With these tips, grammar keeps getting easier and easier, right? Bless you for this post! I hate to say it, but if I come across grammar mistakes when reading others' blogs, I really do get distracted. I'm not perfect by any means, but it's great to keep learning grammar to improve your blog! I wish English were like German where all nouns get capitalized. I worry so much about capitalization in my professional writing and I always double check the capitalization rules in my citation book before my final edit of a documents.